It is generally known that skirts are an effective way to increase the heat transfer to a cooking pot. A skirt is a vertical sleeve, usually of metal, that forces the hot gases from the fire to flow closely around the sides of the pot. pot and skirts will help greatly. Under other conditions, the hot gases rise naturally close to the sides of the pot and skirts will offer lesser benefits under these conditions. At the present, we do not know why the gases sometimes rise along the sides of the pot while under other conditions they do not. 2. The skirt will pick up heat from the flowing gases and radiate some of this heat to the sides of the pot. As a rule of thumb, this accounts for about 1/3 of the heat transfer to the sides of the pot. Skirts can be insulated on the outside, which increases the temperature of the inside of the skirt and increases the heat transfer. 3. 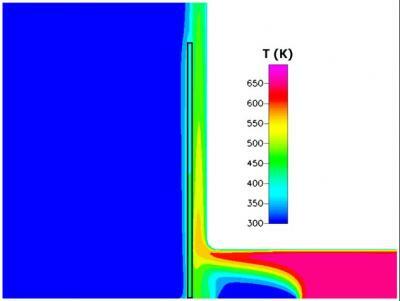 Prevention of radiative heat loss from the sides of the pot. The sides of the pot are at about the same temperature as the contents of the pot, and this is usually warmer than the environment. The sides of the pot will radiate a certain amount of heat to the environment and this is lost from the contents of the pot. While this may appear to be the same physical mechanism as reason 2 above, we distinguish it as a separate mechanism because if all you wanted to do was to prevent radiative heat loss from the pot, you could simply insulate the pot. 4. Cutting of excess air. This applies when the gas flow path through the stove and skirt is closed, that is, when all the air that enters the stove flows under the pot and up through the skirt. In this case the presence of the skirt slows the flow of gas through the stove (unless the skirt is very loose) reducing the excess air and allows the gas to get hotter. The extra temperature of the gas forces more heat to flow from the gas to the pot all over the pot, on the bottom as well as the sides. 5. Reducing the effects of crosswind. To our knowledge this has never been studied, but experiments in rooms with virtually no crossflow of air show highly asymmetric flame patterns. We believe that if there is a significant crosswind, as might be seen when cooking outdoors in even a gentle wind, most of the heat available will be swept away from the stove or fire. Skirts would reduce the effects of this crossbreeze, and the details of the skirt design would determine whether the skirt would have a large effect or a small effect. 6. Reduction in effects of fire asymmetry. As stated above, even in a room with negligible wind, the fire is often seen to be highly asymmetric, even with no apparent reason for asymmetry. There are a number of reasons why a fire might be asymmetric, and this has not been studied, to our knowledge. However, it would be likely that an asymmetric fire would not provide as large a quantity of heat transfer as a symmetric one, and that a skirt would tend to even out the flow of gas along the sides of the pot. For testing details, and the rest of the presentation, download the attached paper An Investigation of Skirts.